Structural masonry takes many forms, colors and textures. Taking advantage of masonry's modularity and loadbearing capabilities may be visually stunning and economically responsible. As we celebrate the 100th Anniversary of the National Concrete Masonry Association, it’s a great time to recognize myriad benefits that structural masonry continues to bring to building projects everywhere. Designers, constructors and owners should take advantage of the benefits provided through current application of this time-honored material and wall system. Both cost and schedule improvements occur as better buildings are built when masonry provides structure and envelope. Maybe the biggest concept to explore, when optimizing through masonry, is that of fit. There are certain archetypes where masonry just fits. Use it there! A common descriptor of one archetype well fit to masonry is where people sleep. Think well aligned floor plans in hotels, apartments, condominium and student residential buildings, senior living facilities, also corrections type facilities. These types of buildings provide the direct opportunity to utilize masonry for not only envelope but structure as well. And not only structure at the perimeter but within the building footprint. Masonry handles both gravity and lateral load resistance very capably. The more walls that are provided, the more economical the construction becomes. When considering the concept of fit, it is important to acknowledge that there are many other systems competing in the same markets as structural masonry. What is equally important is to recognize that well designed and detailed masonry can provide the most economical initial and long-term cost benefits to projects for which it is a good fit. The first recommendation is, then, to consider masonry for structuring these types of buildings and then spend a little time developing architectural and structural concepts that maximize bearing and shear wall layouts in plan and continuity in elevation. When that is accomplished, masonry can be counted on to provide the best and most economical solution. Another aspect to consider is masonry’s fit in construction scheduling. One big aspect to remember is that masonry can be scheduled to quickly follow foundation construction. Other materials and systems typically require production of detailed shop/fabrication drawings and a review period. Fabrication takes significant time prior to delivery and for installation on site. When masonry structures are conceived to be well scheduled, real projects gain weeks of construction schedule – a great benefit to the project owner for more rapid occupancy and to the constructors through lower general condition costs and quicker mobilization to the next project. While masonry structure is being constructed, the envelope is also being completed. The building construction is not just getting to a roof, but is getting to enclosure where other trades can quickly follow while working in protected spaces without extensive temporary enclosure. A final aspect of fit to consider is how masonry fits so well with two new structural needs – the need for storm shelter space and the need for resiliency. 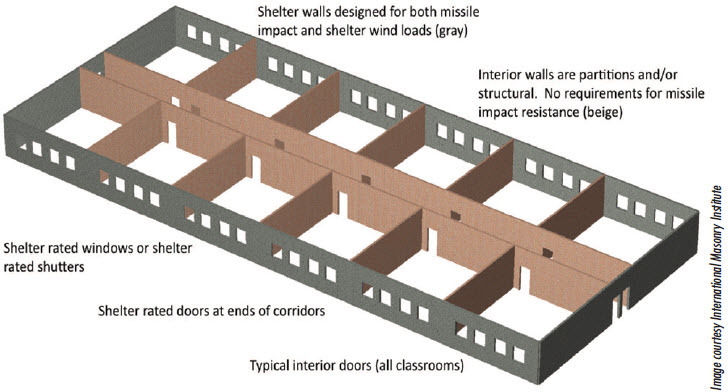 Masonry has proven capable and cost effective as part of tornado shelter spaces through the inherent strength with only modest increases in the net reinforcement required for many wall and structure types. Today’s masonry also provides great resiliency and inherent redundancy through its use-distributed reinforcement. Damage remains localized while surrounding masonry provides continued structural capacity and enclosure. A second concept to explore, when optimizing through masonry, is that of macro-optimization. This concept would be the big idea kind of things related to structural optimization. Probably the greatest direct savings through masonry can be that of eliminating redundant structure (typically structural steel) when masonry is already being used. Cost analyses have consistently shown savings of at least $5 to $7 /sf, to as much as $10 to $12 /sf ormore for per square feet of wall for complete enclosure+structure costs when perimeter steel frames can be eliminated. Repetitive floor plans allow for aligning and employing multiple walls. This optimizes load paths, minimizes gravity and shear loads and provides resiliency. A school can easily be built to function as shelter in case of weather emergencies, like tornadoes and other high wind events. Masonry perimeter walls, corridor and partition walls provide both strength and compartmentation economically in familiar repetition for easy way-finding. Overall project savings can be multiplied when interior walls are converted in addition to exterior walls. An interesting twist on this approach to optimization is that of masonry as a lateral load resisting system. It performs very well in this application through the use of shafts and walls on a project. A key is to recognize that both the masonry and the foundation designs for lateral elements benefit when a greater number of elements and/or linear feet of masonry wall are utilized. I call it the brute force method – but providing more masonry reduces the amount and possible complication of reinforcement required to provide the required capacity. So, plan to use masonry as structure… and while you’re at it, provide lots of structure to simplify construction and reduce costs! Modularity. The final concept to explore here is that of micro-optimization. Where we just looked at larger scale concepts, there are also savings to be found in smaller scale project aspects – the details. Don’t forget that masonry is a modular material – standard units laid in mortar. It makes sense, then, to detail masonry buildings in a masonry module both horizontally and vertically. Think about both the masonry walls and other elements and keeping a masonry module. Also think about elements like doors, windows and louvers or even just openings, that are being placed into the masonry assembly. Both the length and height, and the rectification of the elements should fit masonry modules. Avoid odd cuts in masonry! This means things like using 7'-4" door and window frame head elevations, or 8'-0" or whatever eliminates the cuts. This may seem like common sense, but if we don’t think about it or take the time to execute it, then costs increase unnecessarily and, unfortunately, some project documents exhibit this costly approach to dimensional layout. Lintels. Another aspect of micro-optimization to think about relates to a specific element lintels. Masonry structure is best designed and constructed when masonry lintels are utilized. Unfortunately, many projects are detailed with structural steel lintels rather than masonry lintels. The reality of such a situation is that significant construction delays can occur while detailing, fabrication and delivery of the steel lintels occur. The mason can build masonry lintels and continue working, providing schedule benefits. 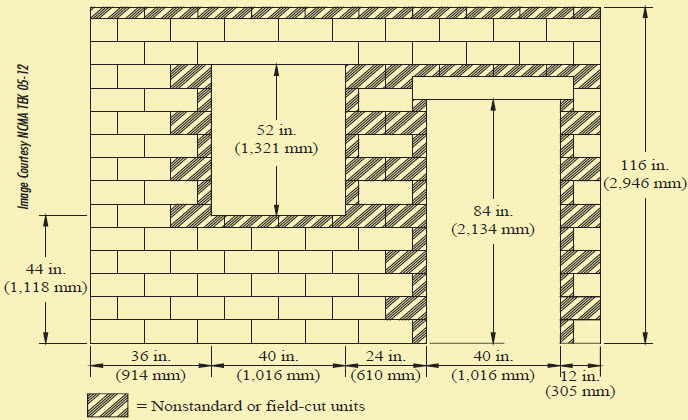 Utilizing non-modular layouts or openings results in unnecessary cutting of the masonry units (shown here as shaded). The end product is more difficult to construct, produces more waste, and is more costly compared to a similar structure employing a modular layout. Additionally, placing and consolidating grout in the reduced-size cores of the field-cut units may prove difficult. Beyond the schedule reality lies detailing and performance detriments associated with steel lintels. They require bearing that interrupts vertical reinforcement, differential movement release that requires complicated detailing. Masonry infill around the structural steel requires challenging anchorage design and installation and localized control or expansion joints that complicate joint layout. These issues more clearly point to the use of masonry lintels. Conventional masonry lintels have been designed in loadbearing walls with spans of 40' and more with reasonable reinforcement while providing exemplary deflection control and structural capacity. Typical masonry lintels for larger openings often require falsework or shoring until the masonry and grout cure. Options exist, however, that allow the elimination or minimization of such falsework. There are patented, proprietary pre-assembly approaches, partially reinforced yet groutable precast approaches and many contractors have developed preferred construction methods to do just that – old approaches utilizing current methods and materials are providing rapid and cost-effective construction of masonry lintels over openings. Strength. The final micro-optimization concept, is that of masonry strength. Design using the proper masonry assembly strength for a geographic area, and then specify it. My point here relates to an observation that, while proper strength specification is improving in recent years, still bears a little emphasis. Don’t just specify and design to an f’m of 1500 psi. For those designing or constructing buildings where the building code is based on the 2015 IBC or later, there isn’t even a code compliance path to an f’m of 1500 psi when using concrete masonry units (CMU) and the unit strength method. f’m 1900-2000 Minimum. If you haven’t checked out the 2013 edition of TMS 602, Specification for Masonry Structures, (or the 2016 edition) I encourage you to take a look. An ASTM C90 minimum strength CMU (Net Area Compressive Strength of Units must be at least 1900 psi) provides an f’m of 1900 psi compared with former codes when the f’m was 1500 psi. Even the lowest mortar strengths provide a masonry assembly strength greater that 1500 psi. Use Type S mortar for structure or any engineered masonry and then specify an f’m of at least 1900 psi or 2000 psi. Directly related to this discussion is the fact that the standard grey CMU in much of the country provide strength well in excess of the minimum due to handling and shipping requirements. Take a look at your recent projects’ masonry submittals and see if you find CMU strengths approaching or exceeding 3000 psi and the realize savings by looking to f’m values of 2500 psi. You’ll save through less reinforcement, possibly thinner walls, reduced bearing requirements, shorter lap lengths and other aspects of masonry design. Check it out. You’ll like what you find! New applications and methods for masonry design and construction make it better than ever. Design the best building while you save time and money when masonry fits. 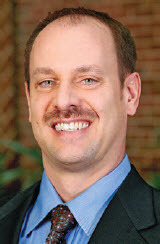 Scott Walkowicz, PE, NCEES, is the owner of Walkowicz Consulting Engineers, Lansing, Michigan. He consults with engineers, architects, contractors and owners on behalf of the Masonry and Structural Masonry Coalitions in Michigan, Indiana/ Kentucky, New Jersey and northwest Ohio along with other groups throughout the Midwest. He designs buildings and specialty structures, and conducts structural investigations of existing structures. He holds BS and MS degrees in Civil/Structural Engineering from Clemson University as well as a BS degree in Architecture from Lawrence Technological University. Walkowicz is a Past President of The Masonry Society (TMS) and is a member of several committees for TMS including Committee 402/602 Building Code Requirements and Specification for Masonry Structures where he participates in revisions to the structural masonry code.